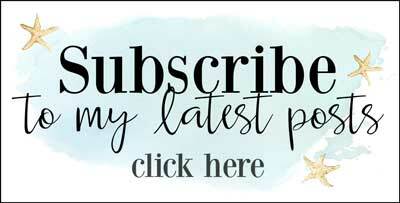 I’m excited to share my 3 steps to create an inviting entryway when you don’t have one. It would be great if home builders and designers recognized that people need a place to drop coats, hats, bags and other stuff as they enter a door. Unfortunately, they often don’t allocate space for that purpose. 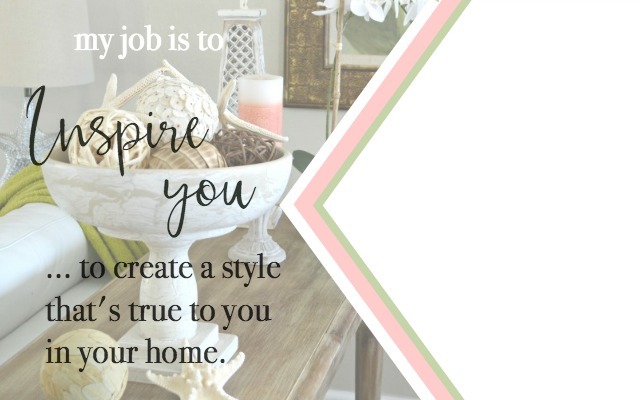 So, I thought I’d share a few simple steps on how to create an inviting entryway out of unused space in your home that looks as good as it is functional. 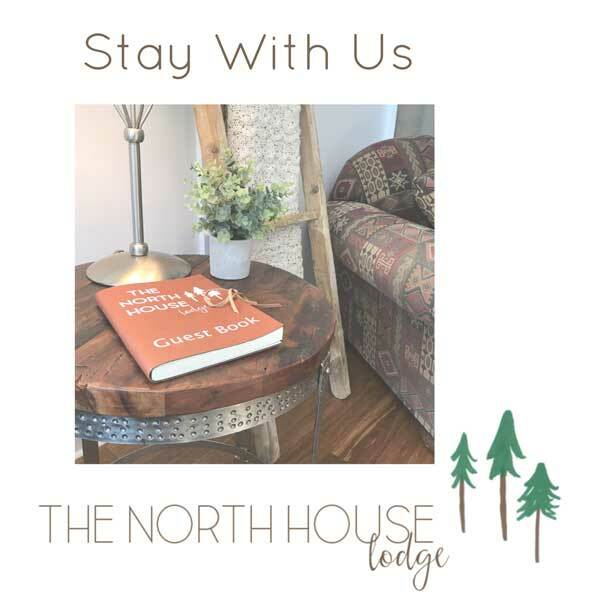 We desperately needed a place to serve as an entryway or pseudo mudroom even though we didn’t technically have either on the #54 side of the North House Lodge. Challenged as I was, I still found a solution. A simple three step solution, no less. This is a sponsored post by Carpet One Floor & Home®. Thank you for supporting the brands that keep H2oBungalow going. Choose a space that can function as an entryway. 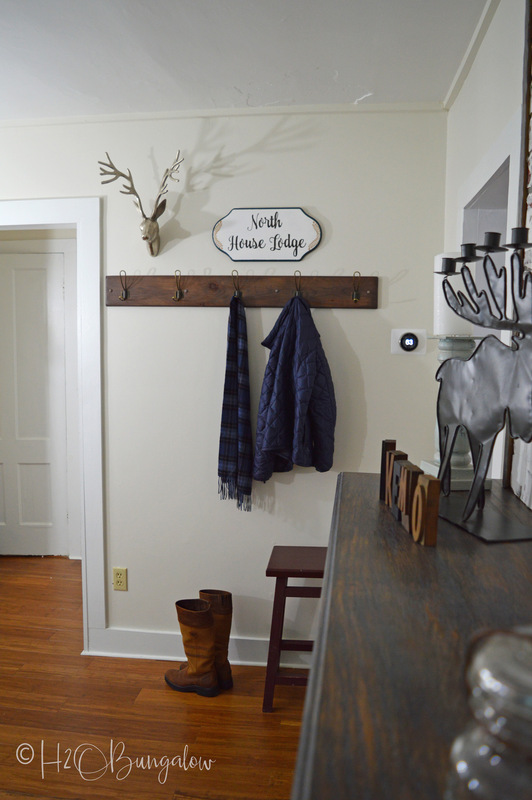 Improvise and create an inviting entryway from a space that’s near the most used doorway. Our most used doorway is the side door in the kitchen. Everybody uses this door to enter the house, it’s by the driveway and the most convenient way to enter the house. But there was no place in the kitchen to create an entryway or drop zone of any sort. My answer was to use the wall just outside of the kitchen. It made good sense since people pass this wall naturally as they walk into the rest of the house. Plus, it’s only a few feet from the doorway so it’s convenient. My improvised entry started with this coat rack. But the space needed more. Create an Inviting Entryway with Furnishings. Use seating, area rugs and wall decor to create a space that looks warm and inviting. 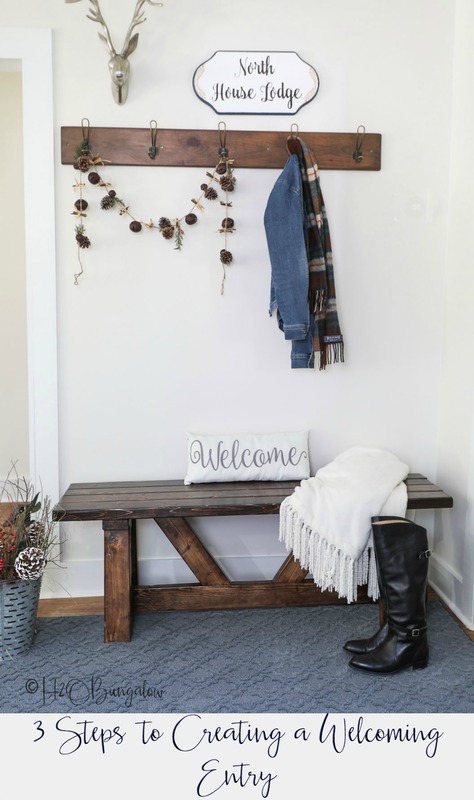 At the same time, use these items to define your DIY entryway as the place for people to comfortably take off boots, hang coats and drop purses. Keep in mind, functional doesn’t need to be boring or expensive. 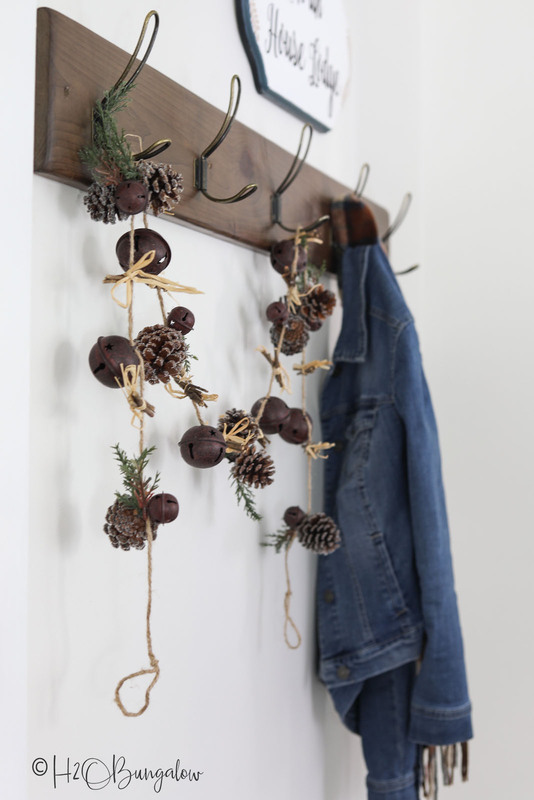 I made this Vintage Hook Coat Rack from a simple 1″ x 6″ pine board. An area rug is the perfect choice to define the space and protect our wood floors. I choose the Relax,…It’s Lees carpet line from Carpet One Floor & Home® several reasons, but the 25 year NO exclusion warranty was the clincher. Keep functionality in mind when creating a entryway. Items like a comfortable bench to sit on when taking off and putting on boots and a large enough coatrack to handle bulky winter layers are much appreciated when needed. 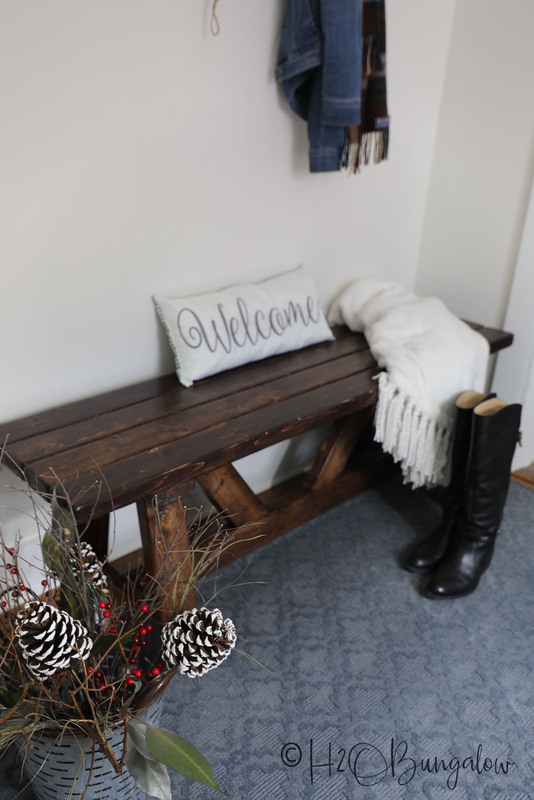 Last week I shared how I made this gorgeous DIY Rustic Modern Bench out of plain 2 x 4’s for this spot. It works great here, don’t you think so? Plus, at about $15 to make, it was a bargain! That’s all there is to creating an inviting entryway when you don’t technically have one. It breaks down into three simple steps. Define it with furniture, rugs and wall art. Just like my Modern Coastal Bedroom Makeover from last spring where I shared how to decorate a room in three simple steps, I kept this makeover simple. But it’s gorgeous, right? I’m in love with how well our entry works for all seasons. 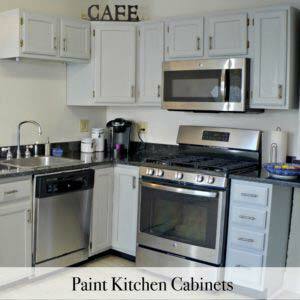 It’s inviting and looks great plus, it’s functional for all kinds of uses. Pin this for later and share with your friends on Facebook! My favorite part? While I love the bench and my cool coatrack, I’d say my Relax,…it’s Lees carpet! 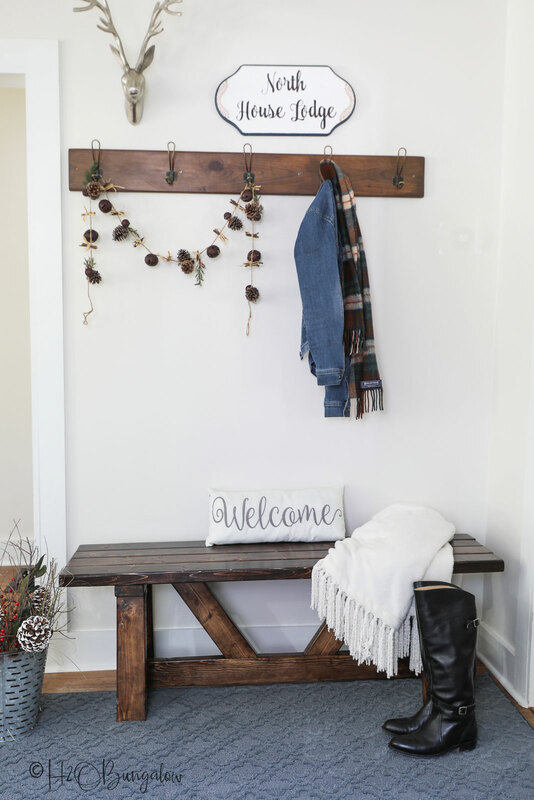 The color and texture are what makes my simple DIY entryway stand out. I choose the Astonishing pattern and Nobility color for my area rug. Carpet One Floor and Home® cut it to size and bound it. The color is amazing and I’m crazy in love with the pattern. Can you imagine how pretty it would be in a full room or as a staircase runner? Because I needed my area rug to last, I choose the Relax,…It’s Lees carpet line. Best of all Carpet One Floor and Home has The Beautiful Guarantee®. If you don’t love your carpet, they replace it for free! You can’t go wrong with that! Picking out my carpet was easy too, with locally owned Carpet One locations all over the US, I found one near us in Vermont too. Sending out a big thank you to Carpet One Floor & Home® for sponsoring this post. Of course, all creativeness and opinions are my own. You guys know I only share products I use myself and believe in. Do you need to add a functional entryway in your home? Is there a space to add one like mine? Share your thoughts below! Can you PLEASE come to Denver to decorate our entryway for me?! Gorgeous!! Hi Angie! That is So funny! I love the way this entry turned out. You should easily be able to copy the look 🙂 Thanks so much for your note and visit, you gave me a good Monday morning chuckle! Another great project post Wendi! Absolutely LOVE the hall bench. Love to know the details on that piece. Wishing you and your family a really great upcoming holiday. Hope your shoulder is healing. Look forward to more beautifully crafted projects by you. Hi Debbie and thank you! I love how that bench turned out too. There’s a link to the plans and the tutorial in this post. The best part of this bench is it cost about $15 to make. Happy holidays to you too! Yes, the shoulder is healing, sometimes a bit slow for me but, patience was never my strength! LOL Thanks so much for your very sweet note and visit! 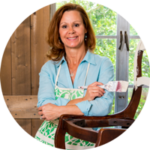 Wendi, for years I had a coat rack that my husband made by my front door. Although our guests enter that way my closet was right there so costs went into the closet right away. For the family we used the door from the garage to enter and I would have costs on the back of my dining room chairs and shoes all over the place. So recently I had my son move the rack next to the garage entry and a benchnthat was in my bedroom went right under it. It’s much more convenient and shoes fit nicely under the bench. This coming spring/summer my son is going to help me sand floors in the dining and living rooms. After 40 some years they are due for a sanding again! I definitely will pin your post bc I would like to look into a new rug like yours. Hi MaryJean! We had the same challenge..minus the closet! I can picture the coats and shoes everywhere. I believe a sturdy bench and a coatrack go hand in hand for an entry. We have this set-up in the other side of the North House by the kitchen door and it’s worked perfectly. Your floors will be beautiful! Enjoy your project and be sure to share a picture on our Wed share day on the H2O Facebook page. You never know who you’ll inspire to tackle project by sharing yours 🙂 Have fun and thank you for your note! Love this entryway. Inspiring me to redo mine! Hi Judy, and thank you so much! 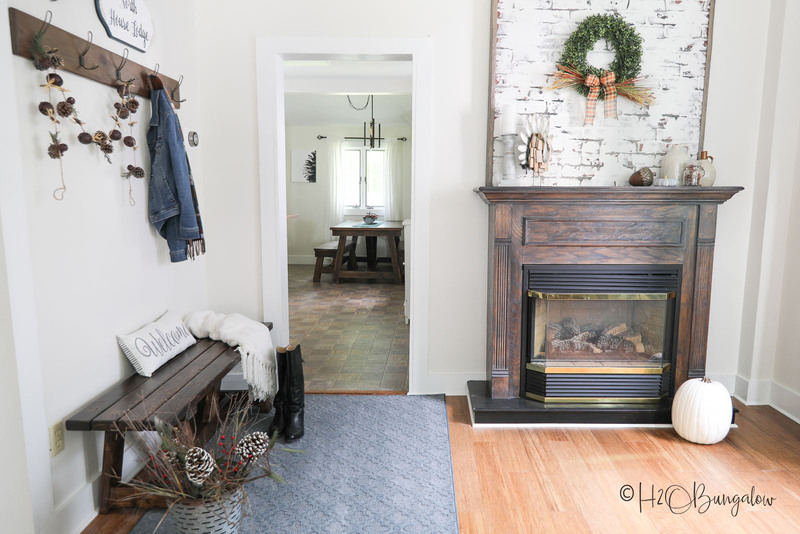 I love how this entryway space turned out and even better my family and friends love it! Thanks so much for your note and visit! I really do need a functional area at my front door that just opens up into my front room! I never even thought about this until I read your post! 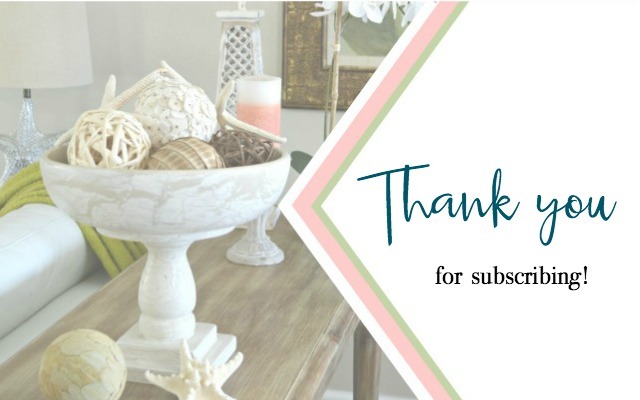 Love the simple steps and inspiration to create this for my coastal home decor! Thanks so much for sharing this, Wendi! Hi Juanita! Designating a space for coats and boots helped cozy up our space and works to keep all the wet items contained in one place. So glad my post was helpful. 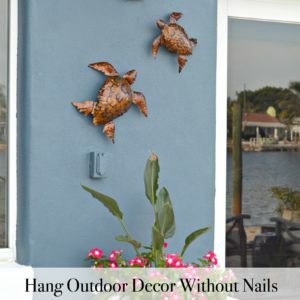 I’m loving this idea so much that I want to find a way to ft one in our beach home too! Please share a picture of yours on our Wed share day on the H2OBungalow Facebook page! It’s always fun inspiration for all! Thanks so much for your visit and note! That is a gorgeous rug! Love that you chose something beautiful yet sturdy enough to hold up over the long haul. Hi Libbie and thank you so much! I LOVE the carpet and even more that it will hold up o our tough VT seasons. What a great solution, right? Thanks so much for your note and visit!